Thermoelectric generators convert heat energy into usable electric energy. If properly harnessed, you can use candles and a few other household items to harness this energy. While it is difficult and complicated to create a generator for your entire home, you can easily create a generator to power a few lights or equipment like a radio. Candle generators also work well as science projects and may offer live-saving light or radio signals in an emergency wilderness situation. Snip rectangles of copper and tin about ½ inch wide and 2 inches long. Both the copper and tin sheet should be no less than 1/8 inch thick. About 10 strips of each metal should be plenty for standard-sized cookie sheets. Grip the end of a copper rectangle with your pliers. Turn up the end about 1/8 inch. Do the same with a tin rectangle. Slip one bent end over the other; use your pliers to squish them flat so they bend into each other and remain secure. Join a copper strip onto the tin strip and a tin strip onto that copper strip. Keep alternating strips this way until you run out of strips. Your joined strips should start with a copper strip and end with a tin one; remove or add another strip if this isn’t true for you. Bend your metal strip into shallow curves at the joints, bending the first one upward and the second one downward. Continue until your metal strip is wavy all the way down. Arrange four bricks in a rectangular shape. Set a ceramic cookie sheet on top of the bricks and adjust them so they support the sheet’s corners. Lay your wavy strip on the sheet, bending it into parallel rows up and down the sheet. Both metals in each downward-curving bend should touch the cookie sheet. Set the second cookie sheet on top of the upward-curving metal waves. Again, make sure both metals in each joint touch the ceramic sheet. Clip an alligator clip wire to the copper and tin end strips. Place several short tea lights under the lower ceramic sheet in a staggered pattern. Light them, and attach your alligator clip wires to the clips on a light bulb holder. These flat, plastic holders contain low-watt light bulbs for use in science experiments. When the lower ceramic sheet warms enough, the light bulb should light. Shoop, Megan. "How do I Make Electricity Using Small Candles?" 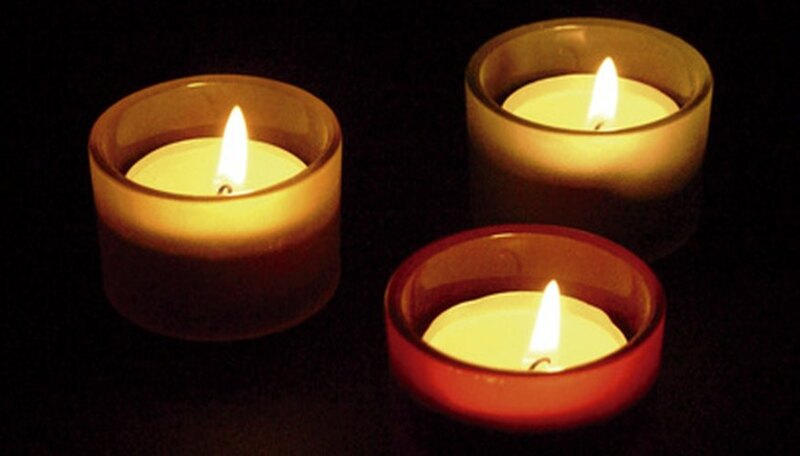 Sciencing, https://sciencing.com/do-electricity-using-small-candles-6852884.html. 25 April 2017.